The earlier posts of this series have covered everything up to making the exposure, and took a bit of a detour to outline a method for performing the work with an improvised camera. At this point one is expected to have a focusing screen, a loaded 4×5 film holder, and an attachment or integrated camera compatible with the same. Two additional items that will prove helpful but are not strictly necessary are a simple hand-lens (a linen tester or tripod magnifier is ideal), and a photographic light meter. I understand that there are smartphone apps that can serve as a light meter, but I have no recommendations on that front. The remainder of this installment will take the form of a checklist. Place the focusing screen on the bellows of the integrated or attachment camera. Properly align the illumination source, the brightest available is ideal but depending on the ideal color temperature for the film non-standard sources may be preferable to those used for normal visual work. Place a specimen on the stage either in the object holder of a mechanical stage or beneath the stage clips (even if neither are usually employed). Where available make use of voltage control or dimmer to moderate the lighting to a comfortable level for visual work. Neutral density filters may be employed where the lamp may not be otherwise moderated. Obtain clear visual focus at the ocular. Where required (as in the photomicrographic BalPlan head) divert the light path from the ocular into the path of the attachment or integrated camera. Remove any neutral density filters in use or turn up the dimmer to provide the color temperature dictated by the film. Where available set the shutter speed to “T” and activate the release to illuminate the cameras light path. If “T” is not present but “B” is employ a locking shutter release. Where available (as in the Integrated Camera System II) focus the image projected on the ground glass using the control on the camera body. If the image will not focus (as is likely if using an improvised camera) one will need to adjust the length of the draw-tube or camera bellows to achieve focus. Do not focus the image on the screen by operating the focusing mechanism of the microscope-doing so will exaggerate any optical defects present. Use a hand lens to view the image seen in a clear area of the focusing screen to achieve fine focus without the interference of the grain of the focusing screen. If available place a light meter over the center of the focusing screen and using the reading calculate the necessary exposure. Close the shutter mechanism and set the shutter speed founding the preceding step. If using an improvised system without a shutter place a light opaque filter (i.e. tin foil) in the path of the illuminator. Remove the focusing screen and replace with a loaded film holder. Remove the dark slide from the holder. Operate the shutter to make the exposure. Note the settings that were used to make the exposure if known. The voltage of the illuminator, color temperature, light meter reading, setting of the cameras control, and shutter speed are of particular usefulness. One should of course note the slides catalogue number, the objective, and ocular (if using one in the cameras light path), used. It’s time to see how the optics of the original B&L Model R perform. To begin with a few common test objects, beginning in this instance with the wing of a fly, will be evaluated visually. Then, the next visual test will be the scales of a Podura springtail followed by the more finely striated Pleurosigma angulatum. The ability to resolve the features of these objects once served the same descriptive needs that the numerical aperture measure serves now. It’s worth mentioning that no special effort will be made to ensure perfectly clean elements, so although this microscope is in exceptional condition for a stand of its age one could expect to see a not insignificant improvement in resolution should the effort be made. All photomicrographs taken will be made with a ring-stand supported iPhone camera. To avoid putting up an over abundance of images that will will only be given a cursory place only two images of each test object will be provided. The lowest power is that marked on the Model R microscope as 75 while the highest power is that marked as 300. It’s worth noting that to configure the Model R to provide the lowest power one must remove the front element of the objective lens and set the draw tube to its shortest length. To achieve the highest power one must use both elements of the objective and set the draw tube to its greatest length. Lighting is provided by a high variable intensity condensed B&L illuminator. In the low power photomicrograph we can see that there is some indication of markings on the various cells of the wing and make out a pattern of hairs on the costa. At the high power end of things we can clearly see the individual hairs of the costa, they are not the toothy spikes represented on the first photomicrograph. The pattern of hairs on the marginal cell is clear but the individual definition is somewhat obscure. It is not immediately clear that they are in fact raised hairs, easy enough to determine with a bit of back and forth of the focusing knob. All things considered the imaging abilities of the microscope are surprising. The axial third of the field of view is surprisingly clear and sharp, even when viewing so comparatively thick a specimen as a fly wing. Except at the lowest power, without the complete objective in place, there is very little evidence of chromatic aberration. In the low power image of the podura scales we are able to discern some implied texture on the surface of the scale, it’s obvious it is not simply a color gradient. Again it is clear that there is some chromatic aberration, more in evidence due to the slight misalignment of the illumination source, but one should expect that when using a divisible objective. Turning to the high power photomicrograph the texture becomes a clear pattern of lines although, one could certainly not make any secure judgment as to the nature of the texture in cross section. It should perhaps not be surprising that the Model R can make no clear statement on that count, there was in fact profound disagreement on the form a podura scales texture would have that was unsettled until the rise of electron microscopy. As a side note, these scales are not intact lined but rather feature a pattern of lines composed of fine hairs. Although the Model R did not provide the performance of a professional stand on any of the test objects thus far it certainly stood tallest on the fly wing. It’s then somewhat pointless to set it against the Pleurosigma angulatum as there’s little reason to expect it to resolve the finer points of the diatoms test. Fortunately, one would hardly expect someone to put such a difficult object before the Model R. It is gratifying though to note that if hard pressed one could certainly enjoying viewing diatoms with the stand, clearly it’s not the ideal object one might chose to observe but it certainly performs far better than one might expect. The red and blue fringes of an achromatic objective are obvious on the photomicrographs of the diatoms; they are by no means reason to disregard the Model R. It would be a great thing if a microscope of this quality were put before every elementary school student rather than the sort of needlessly complicated and overly ambitious toy one can find at any of the “science” themed stores that exist in shopping malls and digital marketplaces. Not having a darkroom doesn’t mean giving up on large format photography; there is a darkroom solution for every problem out there, ranging from fully equipped professional quality spaces all the way to under a comforter, with the lights out, at night. One could run over to a site like localdarkroom.com to see the spaces available in ones area and, if fate is kind, find out a nearby space can be had for a nominal fee. If everything is hopelessly far away or self reliance is more ones style it’s just a question of expense. Free solutions can be as simple as waiting for nightfall and putting towels over every bit of light in evidence in a darkened bathroom, or cleaning out a little space in a closet. 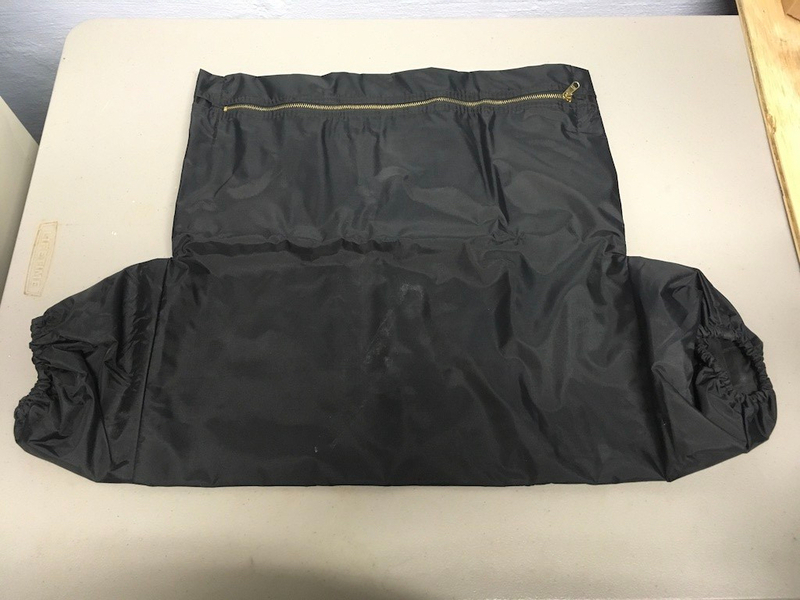 Buying a photographic changing bag or darkroom tent is certainly an option. A changing bag is essentially a darkroom, for ones hands. A fairly large changing bag may be found in the $25.00-$40.00 USD range on any of the countless “we have everything” web-stores, just search for “changing bag.” If going that route don’t try and save a little cash by purchasing an undersized bag that’s really only useful for 35mm work, unless of course that’s ones ambition. Except in cases where every penny must be pinched it’s generally good advice to buy the largest changing bag one can afford; something about darkness turns a meter into a millimeter. With some sort of perfectly dark place, a box of film, and a film holder one’s all set to load some film. The assumption here is that one will be loading up 4×5 film into a 4×5 holder. If working in an improvised dark room take a moment to lay everything out that will be needed in an orderly way. It’s imperative that the box of film be fully reassembled as the final step; it’s no fun at all to have the lid of a box go missing as a result of a cluttered workspace. Where at all possible bring everything that is needed and only what is needed into the darkroom, whether that darkroom is a closet or a changing bag. 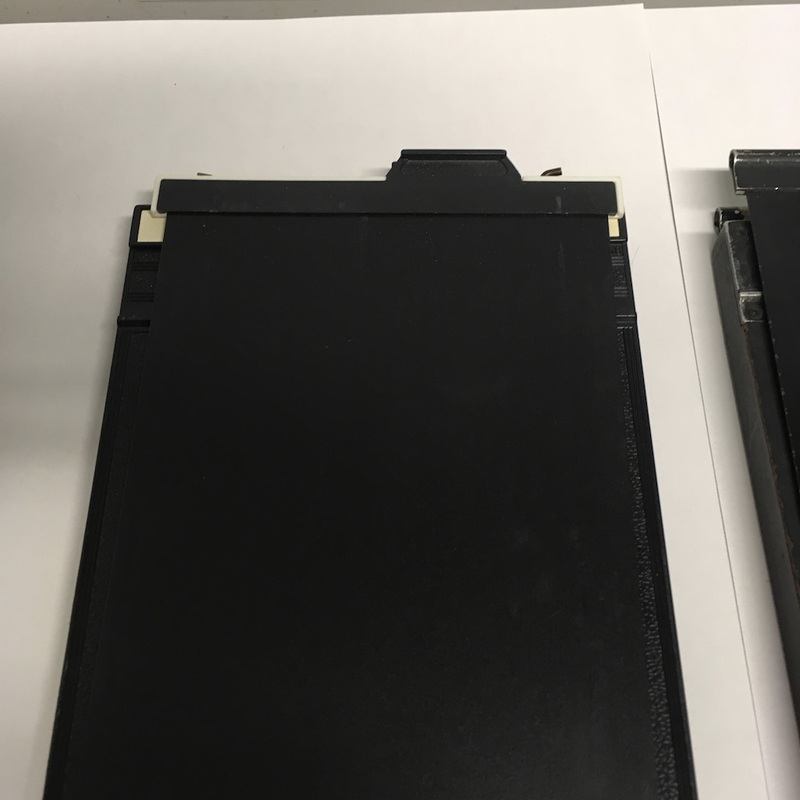 It’s a good habit to open up the dark slides of the film holders as shown before going dark; closing the holders then only after film has been loaded. In this way one avoids both failing to load film and wasting time trying to load a sheet in a full holder. 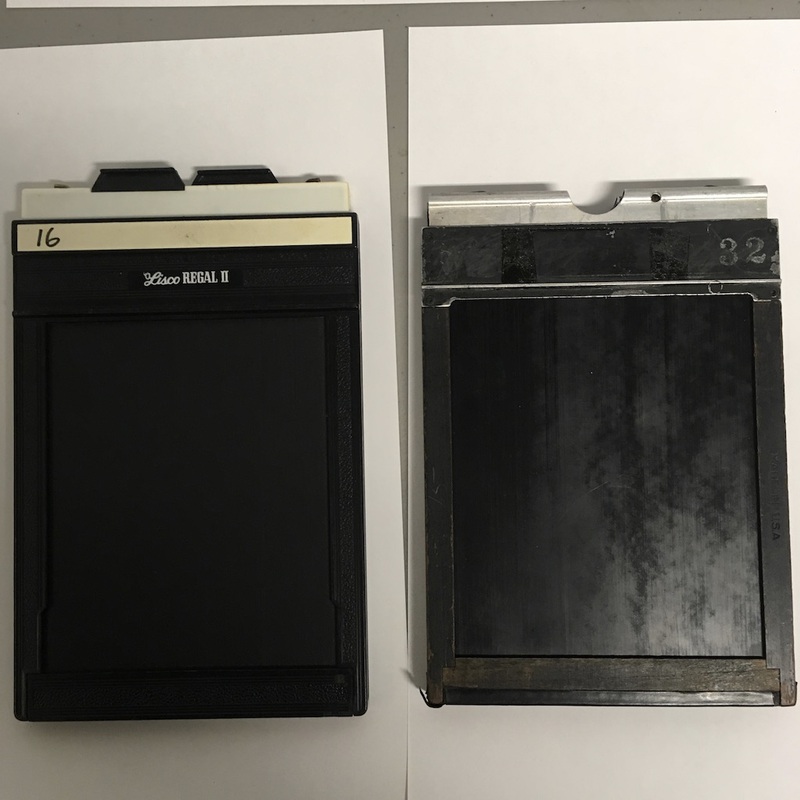 Before the actual business of loading a few notes on film holders and loading 4×5 film. Holders usually have two sorts of indicators to avoid loading film incorrectly and double exposures. The first indicator is less universal and is based on two colors, white and black. One side of the dark slides handle is apt to be painted white or molded from white plastic. By convention this side is placed facing out when the film is un-exposed; it’s ready to see the light. 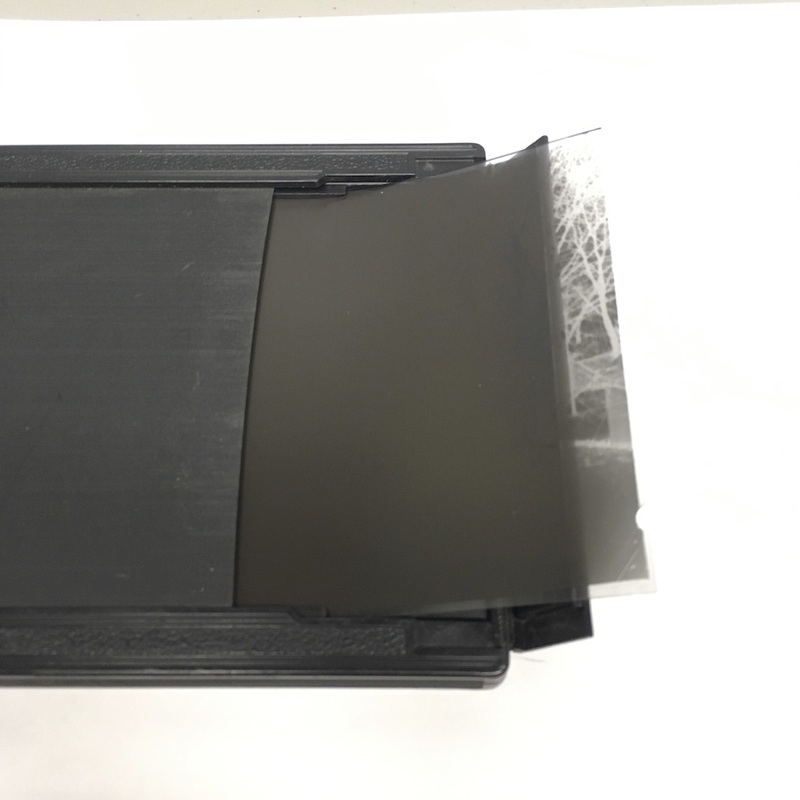 After exposure the dark slide is placed back with the opposite (black) side facing outwards, indicating that the film has been exposed and should only be removed in the blackness of the darkroom. 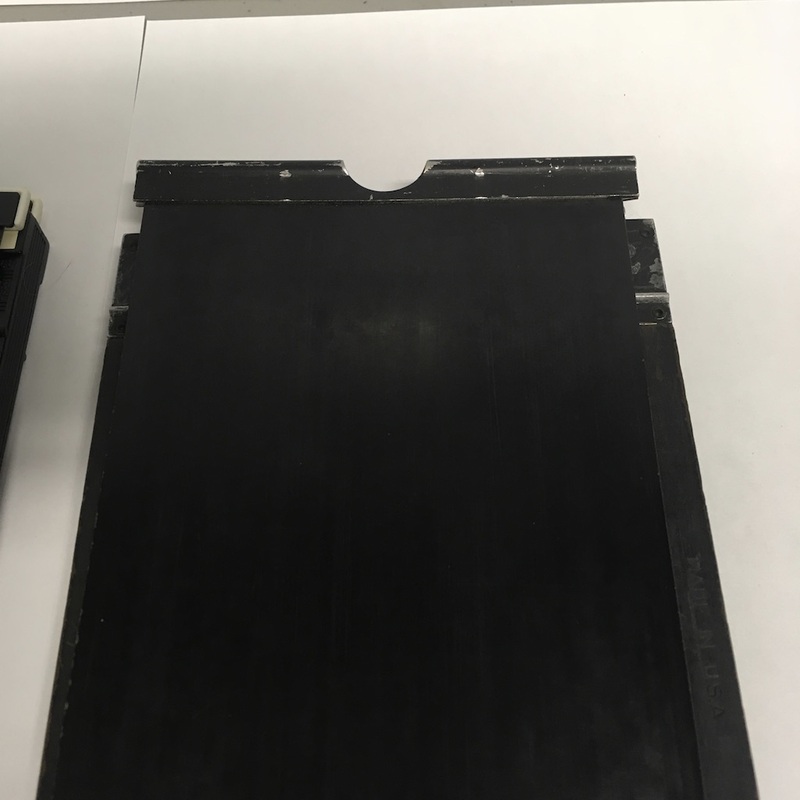 Vintage or antique film holders are liable to have plain metal dark slide handles (or to have had all their paint worn off). 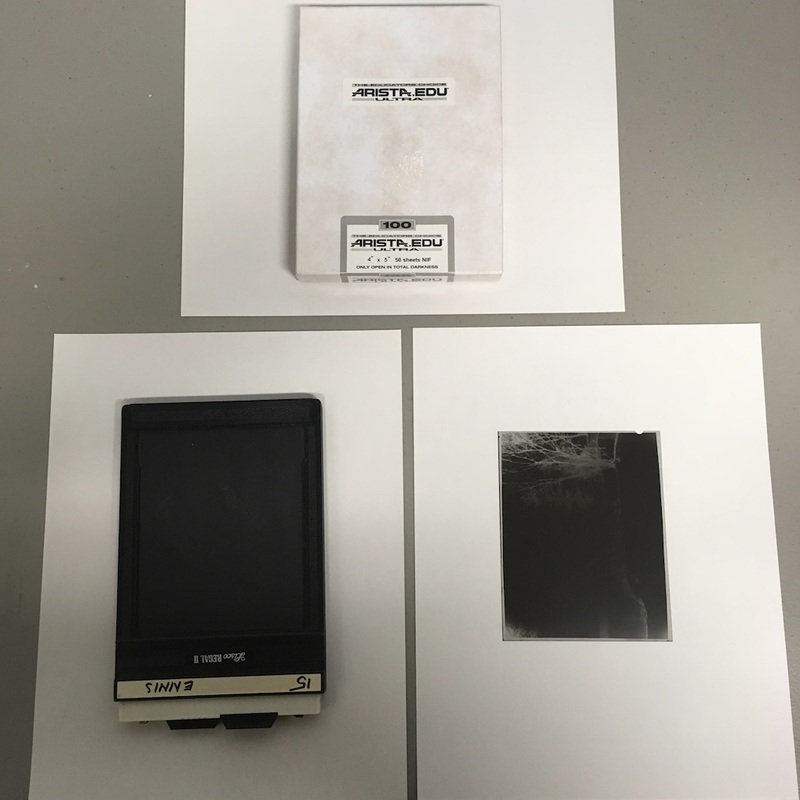 Moreover, one can hardly observe the color on the dark slide when working in a darkroom or changing bag. All film holders thankfully have a second indicator which most commonly takes the form of one or more raised or recessed dots on the upper right hand corner of the dark slide when viewing the un-exposed indicating side. 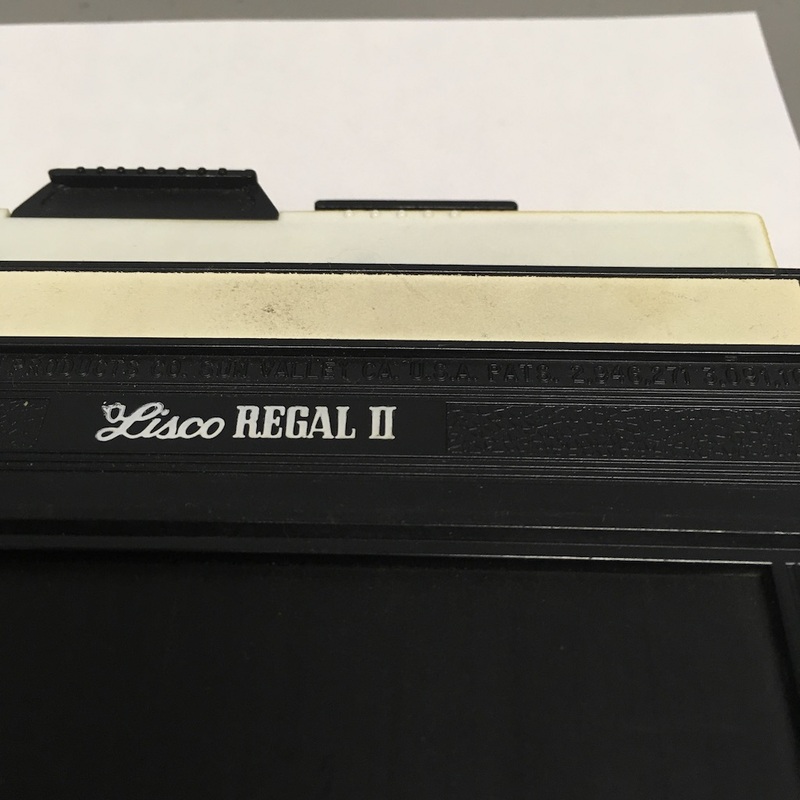 In addition to indicating the exposed or un-exposed state of a loaded film holder the raised dots serve as a reminder of how to properly load film. Every sheet of film has two sides, the emulsion side and the back. 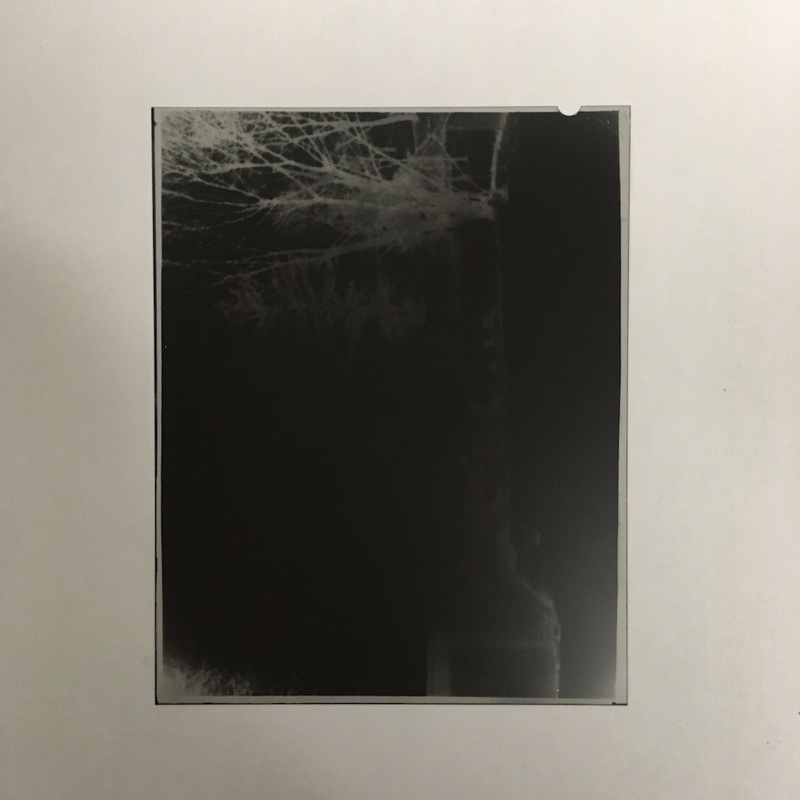 The emulsion side is the side which has been coated with light sensitive material and is the side which should be exposed to the light from ones camera lens. 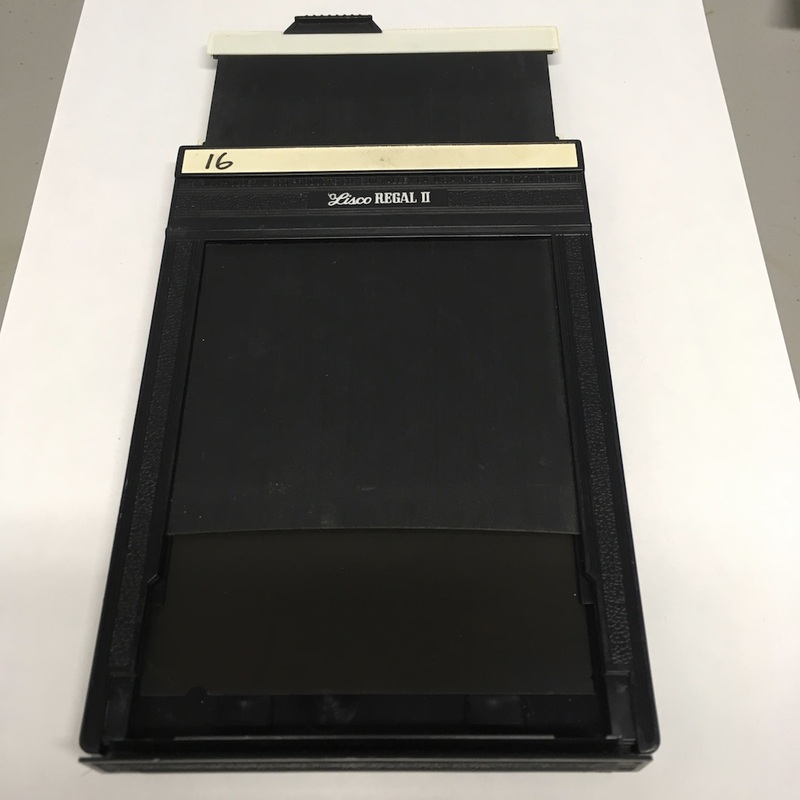 Unlike 35mm film which can only be loaded in one direction (as a result of the cartridge construction) 4×5 film can easily be loaded backwards. 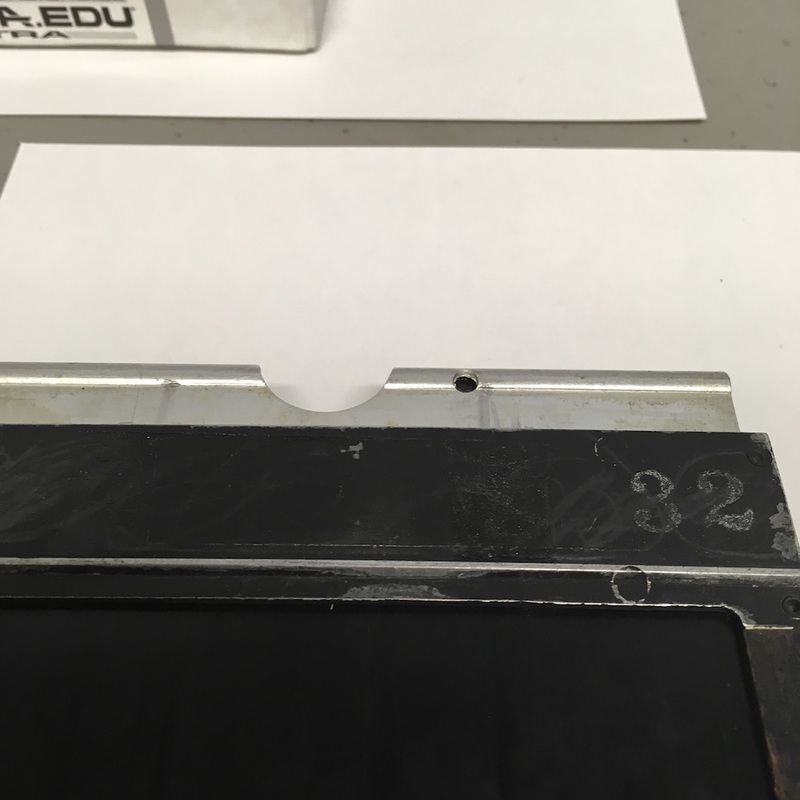 To address this issue every manufacturer includes a small indicator on each sheet of 4×5 film. The indicator takes the form of one or a series of shaped notches in on corner of the film. Different patterns of notches indicate different types of film, speeds, manufacturers, and emulsions. Explanations of the notches is beyond the scope of this post, see the film makers documentation for details. Just as the raised dots of the dark slide should be in the top right when the film is un-exposed so too should the notches in the film be in the top right when loaded. If the notches are loaded such that they are in the top right, whether one loads the film by sliding it up from the bottom of the holder or down from the top, it is not possible to face the emulsion side away from the lens. Thank goodness for chirality. One should prepare for loading 4×5 film holders by giving them a good clean up. Take a clean, 2″ paintbrush, just the sort one would use for painting trim or moulding, and brush out the film holders. In a similar vein it’s frequently recommended that one use some sort of air duster for the task. The thought of so powerfully propelling dust into the air at a time when it would rather be settled seems enough to proscribe that practice. Pull all the dark slides out only so far as to expose the channels into which the film will be slid. Don’t pull the dark slides out all the way, doing so only serves to clutter up the work-space. At the same time do not think to simplify the task by only pulling out the dark slides a very minimal amount; one should be able to bend the partially loaded film slightly upwards to tell that each side is uniformly slid into its channel, a task that’s impossible if the dark slide itself is holding down the film. If a picture is worth a thousand words I own at least one now. Well there it is, enough to get anyone loading 4×5 in no time at all. At this point I’ve got everything I need to shoot some 4×5 film. I could load some film into a holder, and start shooting without any delay. I wonder though, what about everyone else? What if I didn’t have a trinocular BalPlan, a working System II shutter assembly, the proper camera body, and the right adapter? What if all I had was was a basic monocular microscope and dreams of shooting 4×5? Could I get away with something simple and homemade or would that be too impractical. Thinking about the preceding one is apt to consider the old standby of shoe-string photography: the pinhole camera. Such a camera need be nothing more complex than an opaque box with a pinhole at one side. It should then be entirely possible to use the same principles in the task at hand; replacing the pin-hole with a microscope wouldn’t do though. One would need some way of determining focus. Depending on what’s to hand it may prove more or less feasible to solve the problem of focus by building two cameras; the one for focusing only a screen of some sort in place of a sheet of film. Two identical carers could be easy (perhaps two identical shoe boxes) or nearly impossible at a moments notice (the recycling picked up yesterday). In any case I have a ground glass and a film holder so a single camera seems easier. 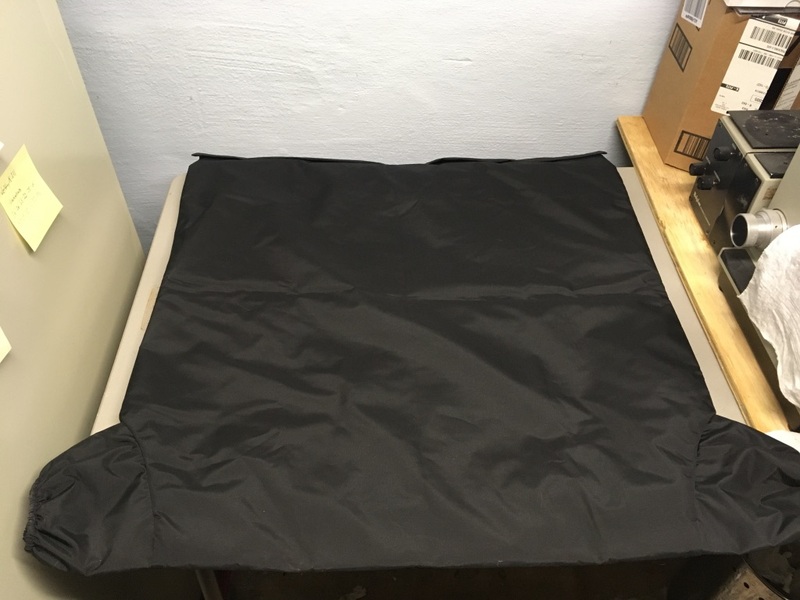 A student should be able to borrow both from the art department or one could buy a holder second hand and make their own screen easily enough.The question now becomes how to attach the box that will be our camera to the microscope. With a basic monocular microscope with inclination joint, using it in a fully horizontal arrangement seems ideal. One needn’t bother with standing on a chair to view the screen or precariously balancing the “camera”. So far, no consideration has been paid to the question of a shutter. The simplest option would be to ignore a shutter in the traditional sense and merely block out the light source with a bit of light opaque material, tin foil, for example. Then we need only consider the need to ensure that the only way light may enter the camera is through the microscope. Easy enough, a hole only just the size of the ocular tube is made in the camera and the connection masked with a bit of gaffer tape. 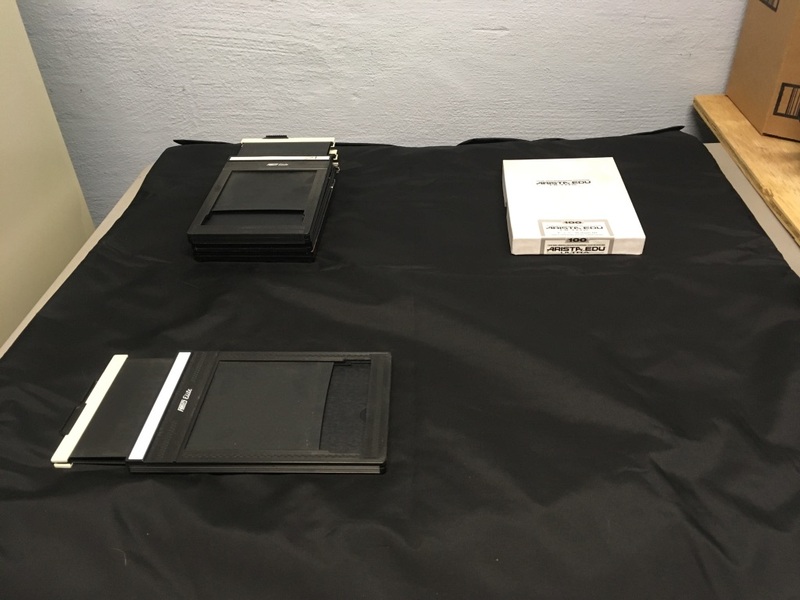 All that remains is to consider how the film holder will be held to the box. This being the most complicated aspect of construction it has been left for last. One need cut away enough of one end of the box so that the light may reach the film. This hole may be made large enough to utilize the entire film or it may be masked so as to provide a circular photomicrograph. With the hole cut one should then glue a few layers of soft dense material to the area the film holder will press against. This material will serve as a light seal. A few layers of dark colored fleece or soft foam insulation will do nicely. To hold the film holder in place one has a number of options, the first that occurs to me is to poke four holes through the box and insert through the same a pair of dowels or pencils, mask the ends with tape for a tight fit, and then stretch rubber bands from end to end to hold the film holder tight against the light seal. 1. Place the specimen on the microscope stage and position the “camera” at the ocular. 2. Affix the focusing screen to the camera. 3. Turn out the room lights, turn on the illuminator, and focus the microscope. 4. Taking care not to move anything, remove the screen. 5. Place the loaded film holder in position. 6. Block the light of the Illuminator with foil. 7. Pull out the film holders dark slide. 8. Briefly remove and replace the foil in the illuminators path to control for exposure. 9. Replace the dark slide with the exposed film indicator facing out. 10. Process exposed film as per developer instructions and enjoy!